Jeff Clark is one of the most renowned and respected big wave surfers in the world, best known for successfully pioneering the massive waves of Mavericks alone for years before it was discovered by the big-wave surfing community. Mavericks is considered to be one of the most dangerous big waves on the planet. Frank Curren, born and bred in Santa Barbara, CA, is the third generation of one of the world’s most prominent surfing families, his father is a legend of the sport, Tom Curren is a 3 times world champion of surfing and renowned the world over for his smooth style in and out of the water, as well as creative mind with experimenting different surfboard designs. His grandfather Pat Curren, was one of the Waimea pioneers and best shaper of big guns at the time, having moved from San Diego to Hawaii, then back to California, Costa Rica and Mexico, he was the icon of a generation and still embodies the true soul of “the search”. Frank is a professional surfer who currently shares his time between his career and several other surfing related activities. 2X WSL Men’s Qualifying Series World Champion, nearly a decade at the WSL Men’s Championship Tour and currently WSL commentator and surf coach, Percy "Neco" Padaratz was already a star in Brazil in 1990, at age 13. Surfing named him one of the "Surfers of the Nineties," along with Slater, Beschen, Machado, and Dorian. During his long professional career, Neco won several professional contests. Known throughout his career for his “swinging sledgehammer” frontside hack, controversies and passionate attitude in and out of the water, an outsider might have the wrong impression of Neco, who is actually super well educated, fluent in three languages (Portuguese, English and Spanish) and a loving father and husband, living in San Clemente, CA for many years, dedicated to coaching the future talents of Trestles, where he can often be seen with a lot of kids around him, and eventually dropping that sledgehammer hack that still turns heads everywhere. Matt is a born and bred local of San Clemente, with 30 years of surfing and travel experience, 10 of those years as a surf instructor at Volcom Surf Camp in San Onofre CA. His travels took him to California, Mexico, Hawaii, Tahiti, France, Spain, Costa Rica, Panama, Japan, New Zealand, Australia and Indonesia. Besides English, Matt also speaks Spanish and a little French. Professionally, Matt is also a fantastic Musician, Electrician, Interactive Multimedia Designer and for fun he loves Diving, Fishing, Snowboarding, Windsurfing, SUP, Foil Surfing, Skateboarding, Skimboarding, Bodysurfing, Swimming. Ricky was born into a surfing family from Carlsbad, CA, both his brother and dad were professional surfers and his dad has been a famous shaper for 55 years. He began surfing competitions when he was 11 years old and has been competing at a high level ever since. Ricky has found his calling in Big Wave surfing after a bad wipeout at Pipeline nearly claimed his life and left him with a broken back. Nowadays Ricky is still surfing every day and charging big surf but married and with children, has held back some more and is focusing in coaching the next generation of Carlsbad talents, following the footsteps of his father in the shaping room and has become an emergency medical technician, something he takes very serious and proudly. A San Diego resident for over 30 years, surf guide Aram Benjamin relishes the opportunity to share the California dream with visitors to this beautiful city. His surf guide resume includes stints leading boat charters in Indonesia during the early years of surf discovery of the Mentawai islands. He has also led tours on the “Just Dreaming” boat charter to remote Panaitan Island along with guiding guests to Frigates Pass from an exclusive resort in Fiji. He currently works with kids of all ages in the San Diego public school district as a visiting teacher. Of course when the surf turns on, he's on it! Rarely missing a good swell, he's completely dialed in to local conditions. Aram is a graduate from the University of California at San Diego with a B.A. in Third World Studies. His passion for surfing and experiencing other cultures has led him to some of the most remote corners of the world. When not in the search of perfect waves overseas, his other interests include snowboarding, ocean swimming and NFL football. Born raised in San Diego, George has been surfing for 25 years and never misses a swell in San Diego or south of the border in Mexico where he goes frequently. George has traveled through Indonesia, Hawaii, Central America and Mexico and speaks English and light Spanish. Born and bred in Florianópolis, 2X Champion of the Santa Catarina Professional Surfing Tour (95 and 99), also ranked among the Top 16 in Brazil for 7 years, and made several finals on the WSL Men’s Qualifying Series, and participated on the WSL Men’s Championschip Tour contest in Florianópolis in 2006 and 2007 beating household names such as Mark Occhilupo and Bruce Irons. A very versatile surfer, passioned for barrels like Pipeline, Teahupoo, and the Indonesian reefs, Guga also has a very progressive surfing and air game. A very unique point of his career was making it into the Guiness Book of Records as the first person ever to surf the tidal bore in the Amazon, which was largely covered by Brazil’s largest TV network at the time. A professional shaper for several years now, he is always innovating with new designs and materials, which make his boards some of the best in the market. Guga is also surf coach and instructor, school teacher (physical education – surfing), professional speaker, surf films producer, surf reporter and an avid student and practitioner of capoeira, yoga, neuro-linguistics and mindfulness. His son, Tuco Arruda, is en-route to becoming a professional skateboarder. Marco Polo is a former WSL professional surfer, having been part of the elite Championship Tour and Qualifying Series for a number of years, as well as a very successful career as amateur, winning nearly every possible existing contest around the world. 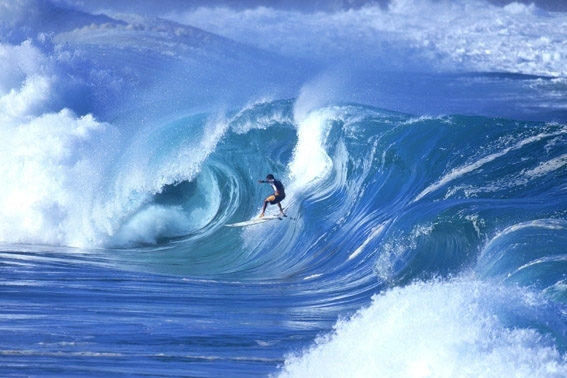 The photo above was taken at the Waimea Shore-break at age 16 on his first trip to Hawaii and instantly became the headline of every major publication around the world. Marco is currently married with kids and lives in his beloved hometown of Florianopolis, where he is still active in several surfing related activities, including coaching professional and amateur surfers. Born in São Paulo, Tracco has been living in Florianópolis for 10 years and surfs since 1992. In 2003 he started his career as a professional surfing video maker, and for 10 years he followed the elite Brazilian athletes around the world on contests and surf trips, the most memorable being Tahiti, Australia, Indonesia, Hawaii, California, South Africa, Mexico, and Fernando de Noronha, which ultimately lead him to be awarded the winner of Best Surf Film of the year in 2007 by Fluir Magazine. Paulo worked for Fluir, Waves.com.br, SporTV, ESPN, Rusty, and Rip Curl, among other brands, media outlets, and directly with athletes like Adriano de Souza, Thiago Camarão, and Jadson André. Currently away from the cameras, he is a passionate surfer who is always looking for swell and wind forecasts in the region and seeking the best spots to go surfing, which give him a great knowledge of the local conditions, waves and beaches. Tracco is graduated in Industrial Design at FAAP and holds an Advanced English Certificate from Cambridge in Perth, Australia and is also fluent in Spanish. Fabio is graduated in architecture at UFRJ and has worked with Brazilian icons such as Claudio and Thiago Bernardes (who btw is also a fellow surfer). Fabio has been surfing for 20 years and teaching at Escola de Surf Rico, Brazil’s pioneering surf school, currently serving over 200 students, whose classes are taught at Macumba beach, a very versatile spot that offers waves for both beginners and experts. “Zé Roberto” has been a teacher at Rico Surf School for over 25 years, with international experiences in Hawaii and Peru. He is alo and expert in weather and swell forecast and closely involved with several beach preservation efforts in Rio. Surfing for him is a lifestyle, not a sport. Zé Roberto is graduated in Physical Education. Mario has been surfing for more than 25 years and travelled around the world to Hawaii (where he lived for 3 years, searching for punchy barrels), Indonesia, California, Peru, Portugal and others. Mario speaks fluent English, Spanish and Portuguese, and when not surfing he is generally busy with his businesses in the island of Fernando de Noronha.